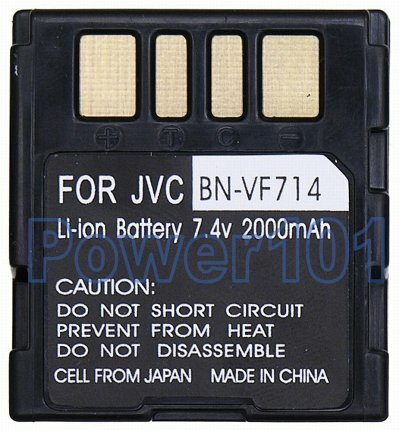 JVC BN-VF714 battery is compatible with VF707 and VF733. 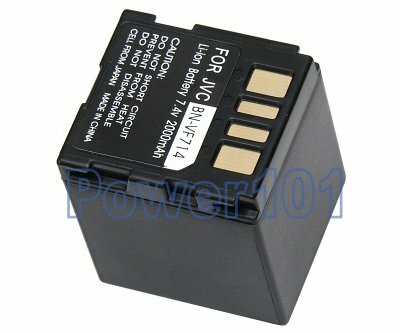 Usually, VF707 is rated as 2-hour, VF714 as 4-hour and VF733 as 6-hour battery. VF707 is the smallest and lightest, thus best for short trips. VF733 is the largest and heaviest, and is the best when filming longer than 4 hours is required. Occasionally, these batteries are referred to as BN-VF707U BN-VF714U and BN-VF733U. The "U" at the end does not imply anything. These are just different names for the same batteries. For an average user, VF714 would be the best choice from runtime vs weight perspective, and VF707 would be the best from size perspective. If you need to film more than 4-hour shows then VF733 would be the best choice. Generally speaking, VF733 extends too much from the camcorder to make it look a bit "unaestetic". If you never plan to film more than 4 hours without an access to an AC source, you should definitely get a VF714 battery. This battery is compatible with JVC GR-X5, GZ-MG50, GZ-MG20, GR-D250, GR-D270, GR-D240, JVC GZ-MG70, GR-D290, GR-D275, GR-D295, GR-DF570, GR-DF550 and many other JVC camcorders. Please check our camcorder compatibility list to see which battery your camcorder needs. These batteries can be charged by any standard charger for BN-VF707, BN-VF714 or BN-VF733 batteries. Or charged directy on your camcorder.